One of my favorite groups of plants is the aroid family Araceae. This family has brought us so many great and wonderful indoor plants. Everything from Philodendrons, Spathiphyllum, Anthurium, Pothos, Alocasica, Dieffenbachia and Aglaonema, with dozens of others. Since the 1980's, Anthuriums and Spathiphyllums have received most of the attention of the plant breeders. They've introduced many new varieties, flower colors, sizes and leaf textures. Now it's the Aglaonemas turn. In the last 5 years about 20-25 new varieties have been introduced. Some have already fallen by the wayside and some of the old varieties are making a comeback. 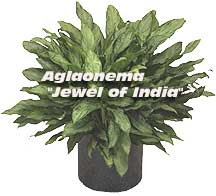 The Aglaonema has been grown for centuries an has served as a workhorse for the professional plantscaper for the past 30 years or more. Until recently the choices were limited to about 4 varieties. The most popular being "Silver Queen". Aglaonemas have remained popular even with limited varieties. One downside to Ag's is that they really don't like the cold weather, drafts. Aglaonemas don't like and exposure to low temperatures. This factor alone can simply limit where you can use these tough indoor plants as well as transporting them during the winter. 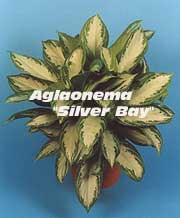 A couple of varieties to keep on the look out for is Aglaonema "Silver Bay", Aglaonema "Jewel of India" and Aglaonema "Silver Ribbon". They all sucker well which helps them not to get leggy, have good color and handle the cooler temperatures. Although Aglaonemas have been used for decades indoors, with all the new varieties coming to market this spring it's going to give you a lot more choices indoors. I'm looking forward to seeing what's around the corner. Make sure you check your local nursery for these new varieties. If they don't have them... all it should take is a simple call to their plant supplier. Just a plant or two can provide a whole new look inside. One of the best features Aglaonemas have is that they are very versatile and easy to care for... if you know the basics. Since the aroid family has always been one of my favorites and I started collecting them back in my teen's. They hold a special place in my plant growing history. They are the plants that really taught me "how to grow". In fact, our second eBook, is devoted Aglaonemas. It covers some of their history, production, old and new varieties, care and disorders. All wrapped up in 80 plus "e-pages" with color pictures, plant specifications and more. It's easy to read (not techie) and written for you, homeowners, plant professionals and garden center personnel.